So much to chat about this morning (that’s what happens when I don’t post that often). My Hubby, John, is definitely my inspiration for Beate’s wsc. He made me so proud yesterday. Some of you are aware that I have a Saint Bernard named “Bailey Bear”. He turns 6 years old tomorrow…so that means he had his yearly check up yesterday. With every Vet visit, I get a stress-induced migraine. It is such a pain and major task to take him to the Vet. I drive an Excursion, so that means get out a ramp; He’s aggressive towards other animals, so that means last visit of the day; We have to wait till the area is clear of other animals so we can sneak him in the back door of their office. Ughhhh! I have taken him every year without Johns help and that means trying to restrain a 170 pound dog with my little Ethan. I had my whole families support yesterday and they all came with me…John did all the restraining. I was smiling from ear to ear and was migraine-free. What do you think? I took a Valentine’s set (SU! Happy Hearts) and put a masculine spin on it. And so glad I did because I didn’t want to wait till January to start inking up this super cute stamp set. I just love this card (I may have to sneak it back into my possession after he looks at it lol). Ready for more pet problems? I don’t think I have shared this info yet. If you are a Stampin’ Up! Demo, you may have seen my “Discover” scrapbook page, with my little Ethan, in the December Stampin’ Success Magazine. See, Ethan has a serious fascination with marine life. We have been to several Aquariums. Due to this obsession, we have a 55 gallon freshwater tank with 4 “Green Terror Cichlids” (very aggressive fish from South America). I am faced with a situation I have never had to deal with. It seems like some fish have decided to…………..well, there are now eggs on one of the rocks. One of the males has become EXTREMELY AGGRESSIVE and all I keep thinking about is the movie Nemo (very beginning of the movie). I have no idea what I am doing lol. I had to separate this rock from even the parents (the Dad started to eat some of them). Okay, the last thing I need is baby fishies. We are going to see what happens so we can educate Ethan, then we will give them to our local fish store. Cambria Turnbow, Charmaine Ikach, Jenn Balcer, Lori Craig, and Sharon Harnist. A big Congrats to Cambria as she is launching a NEW STAMPING COMPANY! Make sure you check out ourcraftlounge. The images are just so cute. Many have inquired on how to make perfect corners with the scallop edge punch. You can view a tutorial at splitcoaststampers. The tutorial shows how to make a square. To make a rectangle, you just change the number of scallops to the sides KWIM. You can create any size rectangle or square by following the tutorial. Finally, I have accepted the su! “lead demo” position for my local Ronald McDonald House in Hershey, Pennsylvania. This is so important to me personally. I hope that I can bring a smile to a Mothers face and distract her briefly with some therapeutic stamping. Just brings tears to my eyes. I don’t think I’m quite ready to work with kids yet, but that is definitely on my list of goals. whoooooo! I think that is all I have to share lol. Have a wonderful weekend and thanks for stopping by. CARDSTOCK: Very Vanilla, Baja Breeze, Kiwi Kiss, Night of Navy. Urban Garden Designer Series Paper. INKS: Baja Breeze, Kiwi Kiss, Night of Navy, and Basic Gray. ACCESSORIES: Kiwi Kiss/Very Vanilla Satin Ribbon, Build A Brad, Basic Gray Tafetta Ribbon, On Board Lots of Letters Chipboard, 1/2″ Circle Punch, Mini Glue Dots, Stampin’ Dimensionals, Sanding Block. Friday means it is time for another one of Beate’s wsc. I received some new Stampin’ Up! goodies this week and couldn’t resist playing with them. When I first saw the Home for Christmas stamp set, I knew I had to have it. I love to watercolor. If I plan on using this set for my holiday card giving, I need to start very soon as this set has so many cute details (and so many coloring possibilities). I used many colors to achieve the above look and they are all listed at the bottom of this post. I used Watercolor paper and an Aqua painter. I did cut away some of the flake from a Little Felt Flurry so I could layer it on top of another….I wanted to create an even smaller little felt flurry. Used my Scallop Edge Punch to the right side of the card so it coordinates with the Scallop Circle in the background of the upper left corner. CARDSTOCK/PATTERNED PAPERS: Old Olive and Baja Breeze Cardstock; Watercolor Paper; Ski Slope Designer Series Paper. INKS: Stazon Brown; Baja Breeze, Old Olive, Always Artichoke, Kiwi Kiss, Riding Hood Red, Sahara Sand, Going Gray, Close to Cocoa, Creamy Caramel, Chocolate Chip, More Mustard, and Blush Blossom Classic Stampin’ Pads; Real Red and Old Olive Markers. 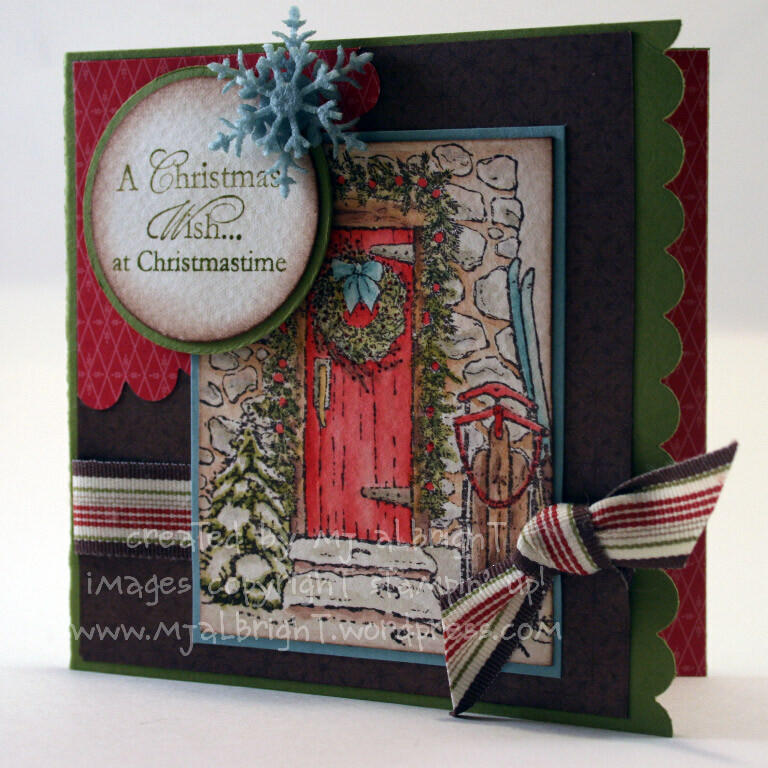 ACCESSORIES: Alpine Ribbon Originals; 1-3/4″ Circle Punch; Coluzzle; Aqua Painter; Sponges; Little Felt Flurries; Scallop Edge Punch; Big Shot die-cut machine; Scallop Circle Bigz Die; Stampin’ Dimensionals; Mini Glue Dots. I will be absent again for a while as I do have some approaching deadlines. Seems like I only have time to post for Fridays lately. I will be able to see my work elsewhere though…I will post details later.